Headquartered in Underwood, Nottingham the company designs, installs and maintains commercial fire and intruder alarms, CCTV and access control systems for clients across the UK. 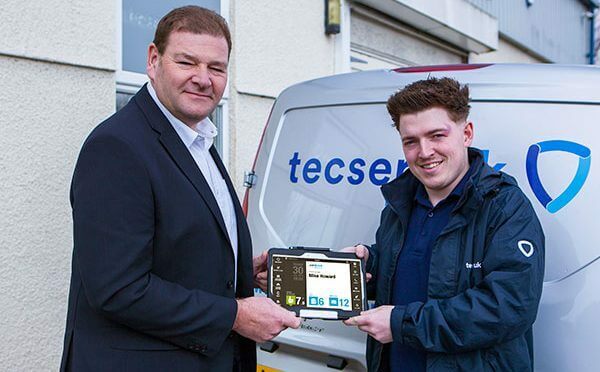 After evaluating a number of providers, Tecserv UK chose the JourneyWatch system from BigChange combining real-time tracking of vans, intelligent separation of business and private mileage and an integrated driver mobile app that manages timesheets, expenses and gives its fully certified technicians feedback after each journey to encourage safe and responsible driver behaviour. Tecserv UK has installed the new technology to help it enhance the round the clock service it provides to customers including the NHS, Marks and Spencer, Pinewood Studios, Harvey Nichols, The National Trust and construction industry clients such as Portakabin. Contact centre agents at Tecserv’s monitoring centre in Nottingham liaise with customers 24/7 to respond to urgent reactive service requests as well as to manage the ongoing installation and routine servicing of alarm and CCTV hardware. With a team of field based service engineers covering the whole of the UK, maintaining complete visibility of the entire operation can be a challenge. The JourneyWatch system from BigChange gives all call-centre agents and planners instant visibility of the live location and progress of all company technicians. Integrated customer relationship management (CRM) means that all customer sites are saved in the system, so that rather than just seeing the name of a street, operators can instantly understand which contact each engineer is visiting. When responding to urgent reactive work, the system identifies available engineers in order of proximity together with information about their skills, qualifications and the type of vehicle and tools that they have available. This has enabled Tecserv UK to enhance response times ensuring that the ideal resource attends every job. This is supported by a variety of proactive alerts that enable efficient management of the operation. These include automatic emails and text messages to drivers and management when vehicles travel on toll roads or enter the London congestion charging zone, ensuring fees are paid and fines not incurred. Alerts also highlight when vehicles have been stopped at a location for an excessive period of time. The BigChange technology is also assisting back-office administration. Technicians use a dedicated private button in the vehicle to differentiate between business and private mileage. This is providing robust information that the payroll department can use for meeting HMRC reporting requirements. In addition, vehicle tracking data assists with verification of timesheets and overtime claims. The BigChange technology also gives Tecserv UK the option to upgrade at any time to full works-order job management with intelligent scheduling.